Are you looking for a vacation or cruise experience that is head and shoulders above many of the ordinary options currently available? Are you interested in a vacation that is as unique as it is memorable? If so, you need to consider the many tall ship cruises, including Windjammer cruises and Star Clippers Cruises, currently available from Sailing Ship Adventures. All of our tall ship cruises, including our Windjammer Cruises and Star Clippers Cruises, offer a wide range of itineraries and activities not available on traditional cruises. Wake to the sound of gulls and the taste of sea spray as your tall ship skims across sun-dappled crystal seas. Contemplate your day as you bask in sunlight and enjoy breakfast under the tall ship's billowing sails. Will you spend your day taking a turn at the helm, watching dolphins swim in your tall ship's bow wave, following the ship's wake, wind surfing for the first time, or maybe hoping for another look at the whale and her calf that appeared off to starboard yesterday? In addition to offering many of the same activities and opportunities available on conventional cruises, tall ship cruises from Sailing Ship Adventures, including our Windjammer Cruises and Star Clippers Cruises, offer a wide range of activities normally not available on traditional cruises, including deep sea fishing, snorkeling, scuba diving, and more. On some tall ships, you can even serve as a deckhand, taking the helm, raising and lowering sails, and taking your turn in the watch rotation. The excitement doesn't stop once the ship pulls into port, however. Out tall ship cruises visit many of the same ports as traditional cruises, as well as several hidden gems that aren't accessible by the major cruise lines. The itineraries of our tall ship cruises are loaded with a wide variety of activities to suit almost any taste or interest, including shopping, golfing, hiking and nature tours, beach combing, and more. Our Windjammer schooner cruises provide our guests with the unique opportunity to feel weathered teakwood beneath their bare feet as they skim across the crystal blue waters of the Caribbean Sea. 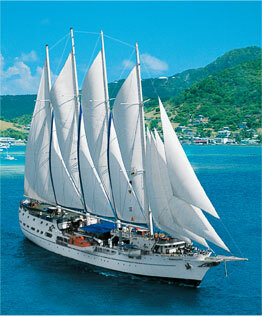 We offer a wide variety of Windjammer cruises departing almost daily for destinations throughout the Caribbean. All of our Windjammer cruises include a wide variety of fun and authentic excursions designed to put you face-to-face with the local environment and cultures. Not only does our wide selection of tall ship cruises include several Windjammer cruises, it but it also includes several Star Clippers cruises, including cruises aboard the Royal Clipper. The flagship of the Star Clippers line, the Royal Clipper is the largest full-rigged sailing ship in the world, and the only five-masted full-rigged ship built since the beginning of the last century. 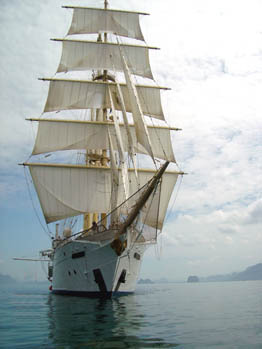 In addition to the Royal Clipper, Sailing Ship Adventures also offers Star Clippers cruises aboard the Star Clipper and the Star Flyer. These popular star clippers are sister ships, fleet, 4-masted barquentines created for comfort-loving passengers interested in cruises that combine modern amenities with the magic and romance of the legendary era of sailing ships. To find out more about our Tall Ship Cruises, Windjammer Cruises and Star Clippers cruises, simply call us at 1-877-882-4395 or fill out this online contact form, and soon you could be well on your way to the experience of a lifetime!